Fans are often complaining about players who are overpaid. But here's a look at five Vikings who should be well worth the money they're scheduled to make in 2018. With 218 catches for 2,705 yards and 16 touchdowns, there may not be another Vikings player who has outplayed his current contract more than receiver Stefon Diggs. He’s made about $1.8 million in three NFL seasons, and is set to make $1.9 million at the end of his rookie deal. The deal: Let’s call Thielen and Dalvin Cook 1a and 1b on this list. 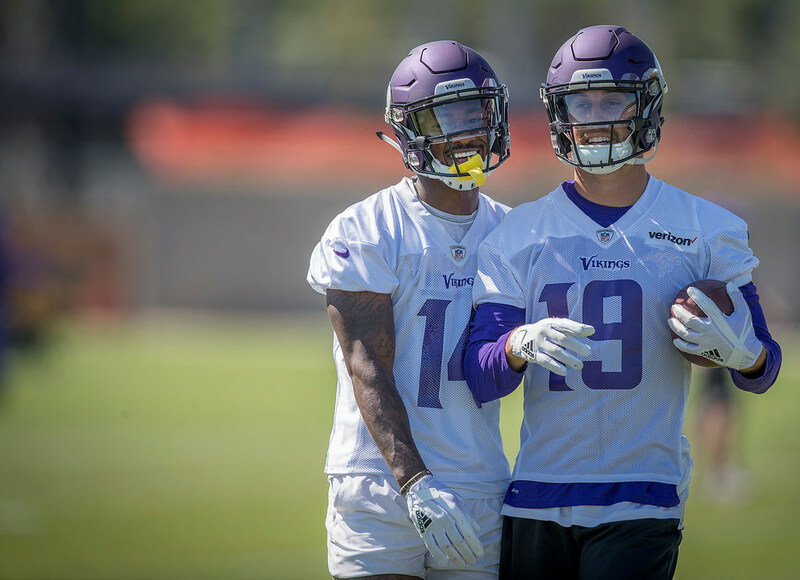 Thielen has been outperforming his contract ever since he got $11 million guaranteed on a three-year extension after the 2016 season (when he had 89 career catches for 1,248 yards). He more than doubled his career numbers last season with 91 catches for 1,276 yards, establishing himself as one of the NFL’s top receivers. The Vikings would be wise to revisit his contract soon and keep happy one of their top weapons. The deal: Rookie contracts… With all the big-money deals to keep stars, the Vikings need contributors on bargain deals. There are fewer better examples in the NFL than running back Dalvin Cook, who played 70 percent of the snaps before tearing his ACL in Week 4 and is again expected to play a heavy role in the offense under John DeFilippo. Cook is expected to be the engine driving the offense, with $84 million quarterback Kirk Cousins thriving off the run game as he did with impressive play-action numbers in Washington. Cook’s workload this summer will be monitored as he eases back in. At this rate, they should let him go as far as his surgically-repaired left knee can take him. The deal: Elflein showed promise in an up-and-down rookie season. He’ll be expected to take another step forward in 2018 while anchoring the middle of an all-too-often unstable offensive line. His ongoing recovery from ankle surgery this offseason hindered one of the items on his to-do list: the weight room. What is certain is Elflein, an agile center, is expected to be a great fit for the Vikings’ movement-based offense under first-year coordinator John DeFilippo. The deal: Robison gave back about $2 million in a contract restructure to remain with the Vikings this offseason. The longest-tenured Viking is expected to retire after a 12th season in Minnesota. With how often Mike Zimmer likes to rotate defensive linemen, he’s expected to again play a part-time role on one of the best values in the NFL. His year started by filling in for the injured Everson Griffen throughout spring practices. Robison should add to a current total of 60 sacks before calling it a career. The deal: Smith has been under the radar for years, but he stepped into the national spotlight in 2017 with a first-team All-Pro selection and third consecutive Pro Bowl after leading a 13-3 team. He’s better than fifth best in the league, which is what his $10.25 million per season ranks on a five-year contract signed in June 2016. As big of a letdown as the NFC Championship loss was, it wasn’t indicative of Smith’s play, nor that of many members of the defense. The deal: Hill took starting reps at right tackle throughout the spring and could again be heavily relied upon by the Vikings offense. Hill’s readiness will either factor immediately at right tackle, or if Mike Remmers starts there would help stave off rookie Brian O’Neill’s debut in the event of an injury to a starter.